There are three types of publications related to the EUSFLAT 2019 Conference. The most usual one is the full paper in the Conference proceedings. The full papers will be reviewed by independent reviewers and in the case of their acceptance, they will be published in the proceedings by a reputable international publisher. The second type of publication is the abstract. The submitted abstracts will be considered by the programme committee mainly from the scope, relevance and the novelty points of view and in the case of their acceptance, they will be published in the Book of Abstracts. Finally, we have a preliminary agreement with publishers on publishing post-conference special issues of their journals. Each conference talk should be accompanied by a single publication: either an abstract or a full paper. Do not submit both types of publications related to a single talk. Preparing papers: Submitted full papers have to be of at least 4 pages and at most 8 pages length. The only allowed format for the submission is PDF. There are two ways, how a PDF file can be built. The first one is using Word template and by exporting to PDF. The second one is using Latex template and by building PDF using Tex engine. We strongly recommend to use the Tex!. If you do not have experience with tex and do not know, hot to install the whole machinery, you can use an online template in Overleaf, where all necessary libraries etc. are already pre-installed. Submitting papers: The authors should submit their papers electronically, written in English, due to the given deadline, through EasyChair. When submitting your paper, choose the track "Full papers in proceedings". Then in the second step, you will be asked to choose a special session or a particular topic. Publishing full papers in proceedings: The accepted papers will be published in Atlantis Studies in Uncertainty Modelling (ASUM) series which is a new proceedings book series published by Atlantis Press in collaboration with EUSFLAT. The proceedings will be published under Open Access and will be submitted for an inclusion to major bibliographic databases, including CPCI (Web of Science), Scopus, Compendex/EI, or CNKI. The series Atlantis Studies in Uncertainty Modelling publishes conference proceedings with unpublished original research advances of theoretical as well as application-oriented work focused on distinct aspects and essences of uncertainty modeling and management, especially from the field of computational intelligence. The ASUM book series editors are Humberto Bustince, Guoqing Chen, Radko Mesiar, and Gabriella Pasi. Camera ready papers: Camera ready full papers have to be of at least 4 pages and at most 8 pages length in PDF prepared according to the instructions (preferably using the LaTeX style and template files). The camera ready has to employ the reviewers' comments. Submission has to be done via the EasyChair system. 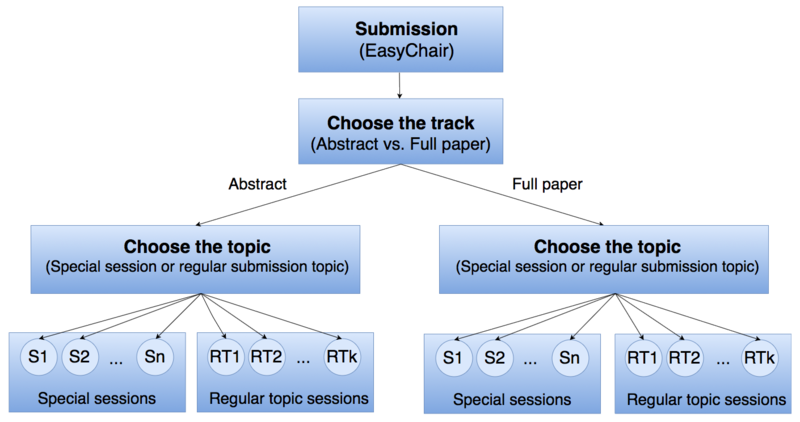 Submitting abstracts: When submitting your abstract through EasyChair, choose the track "EUSFLAT 2019 Abstracts". Then in the second step, you will be asked to choose a special session or a particular topic. Do not enclose any attachment, edit the abstract directly in the online window of the EasyChair system. Publishing abstracts: The accepted abstracts will be published in a separate Book of Abstracts published by the University of Ostrava. The Book will be equipped with ISBN number and it will contain also abstracts from the full papers submitted to the proceedings. This book will serve as a working material and it will be distributed to all attendants at the conference site. Camera ready abstracts: Camera ready abstracts have to employ the reviewers' comments and the submission has to be done via the EasyChair system. We have a preliminary agreement with publishers to organize special issues on chosen conference topics. These topics will be chosen based on the submitted paper full papers and abstracts. Authors will be then invited to submit their original contributions directly to the journals. The negotiated journals for the special issues are mentioned below. International Journal of Computational Intelligence Systems is the main journal of the EUSFLAT society. It is an open access journal with article processing fees, however, due to a long-term relationship with the Atlantis Press publisher, up to 20 papers per year authored by EUSFLAT members are exempt from paying the article processing fee. Note, that IJCIS is a high-quality journal that is indexed in major indexes including SCI (Web of Science), Scopus, CNKI and Compendex. Axioms is one of the EUSFLAT recommended journals. It is an open access journal with article processing fees, however, due to a long-term relationship with the MDPI publisher, EUSFLAT members have 15% discount from the article processing fees. Note, that Axioms is a reputable journal that is indexed in major indexes including ESCI (Emerging Sources Citation Index under the Web of Science), Scopus, DBLP and zbMATH.